What do you say when someone says that they want to make an egg-laying robotic chicken? 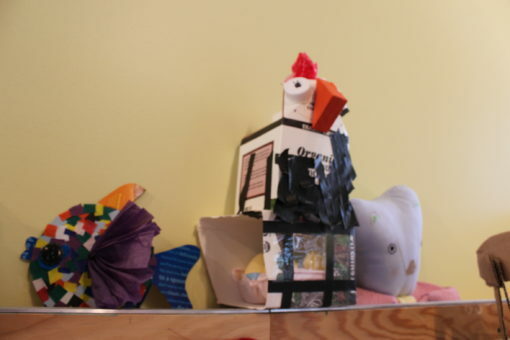 In MAKESHOP we would typically answer that question by first searching through our recycled materials to find just the right thing to make a chicken. 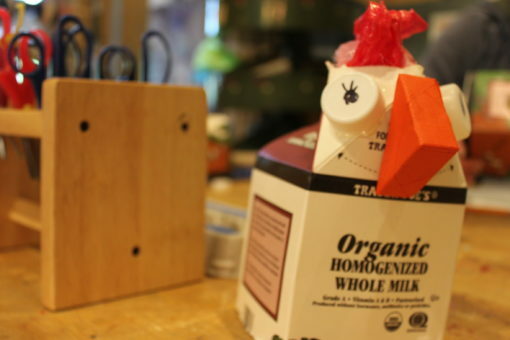 Apparently an empty milk carton makes a great chicken shape. 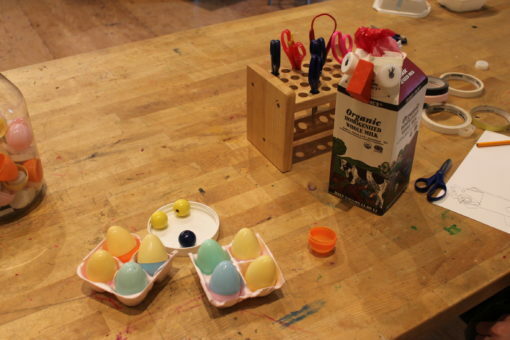 The plastic eggs were from a donation of materials brought in by a regular visitor to the Museum. If I had to guess I would assume that the discovery of the plastic eggs are what prompted the idea of a robotic, egg-laying chicken. Projects like this are always fun to be a part of. The mother and daughter team that came up with this idea spent a lot of time brainstorming, discussing and planning this project. 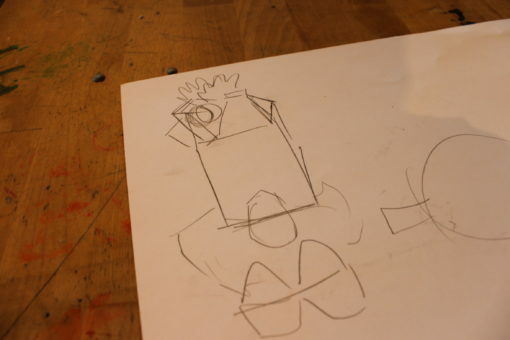 There was an initial sketch of the idea before the actual construction began. A sketch helps you get your thoughts in order and lets you decided exactly what kinds of materials you are going to need. Sometimes you just need to grab a bunch of materials and see what happens, but this project really required some insight. We eventually thought of a name for the project, “C.H.I.C.K.E.N.” We never did quite figure out what the letters would stand for but the format of “chicken” certainly seemed robotic. This project took on an almost inventive nature to it. In the end we were thinking about how other kids would play with this thing. It is always fun to make things with other people in mind. It also takes a lot of work. In the end, the “C.H.I.C.K.E.N.” was put on display as an example of what can be done with a little bit of planning and brainstorming and a lot of imagination.